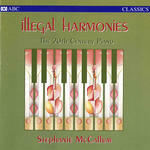 Illegal harmonies : the 20th century piano / Stephanie McCallum. Three Scotch folksongs : piano solo / Percy Aldridge Grainger ; edited by Ronald Stevenson. From "Songs of the North"